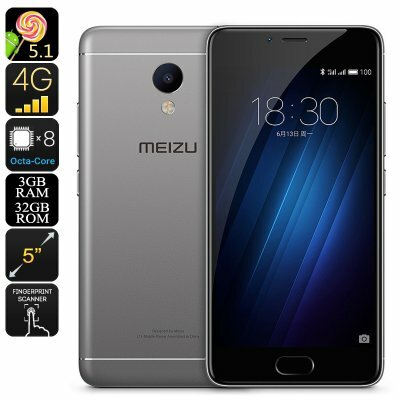 Successfully Added Meizu M3S Android Smartphone - MTK6750 CPU, 3GB RAM, 4G, 5 Inch Screen, Android OS, Fingerprint Scanner (Gray) to your Shopping Cart. Meizu M3S has a sharp and assertive design with its aluminum construction and 2.5D curved screen. It's undeniably premium finish is hard to find on such as well priced smartphone and makes the Meizu stand out from the crowd. The all-in-one navigation button is also a fast and responsive fingerprint scanner that combines the functions of home and back buttons. This is a far more intuitive way to interact with the phone is well supported on Meizu's custom Flyme OS and brings convenient security. It's not just the design and build quality that impress, the Meizu M3S has some very alluring specs and competes alongside high-priced models from other leading brands. With a 5 inch display the Meizu M3S sits comfortably in the hand and despite its compact size packs a punch in the processing department. An MTK6750 processor has an impressive 8 cores with 4 running at 1GHz and 4 running at 1.5GHz it brings a dynamic performance able to meet all your demands while still saving on power. 3GB of RAM helps it cope with the latest games and multitasking while a Mali T860 GPOU ensures a stellar graphics performance. A respectable 32GB of storage is available on this Smartphone but if that isn't enough you can take advantage of the micro SD card slot to add a further 128GB of storage. With 4G supported across FDD-LTE 1800/2100/2600MHz, TDD-LTE (38/39/40/41: 2555-2655MHz) frequencies and the option to use two SIM cards simultaneously means that the Meizu M3S has good network coverage so you'll be able to enjoy the fastest download speeds while on the go. A rear camera that brings 13MP images is another winning feature on this smartphone and can deliver video in full HD quality. Thanks to its 3020mAh battery this Android smartphone delivers plenty of usage time and for its affordable price, it's a great mid-range option for those on a budget. The Meizu M3S comes with 12 months warranty, brought to you by the leader in electronic devices as well as wholesale Android smartphones..